Pre-baby I always had a savoury tooth. My favourite ever lunch would be bread with lots of unsalted butter, cheese and crisps. My foodie holiday heaven would've been France as we used to eat that pretty much every lunchtime on childhood holidays. Sure I liked sweet things. But given the choice between, savoury won every time. Even in the early months of pregnancy, I was convinced I was having a boy because I craved red meat (now know that's due to anaemia). But the minute I had my scan, it was almost like the switch governing my sweet tooth was flicked to 'On - hyperdrive mode' and I found myself daydreaming about puddings, baking and chocolate. Anyhow I just had to have some chocolate cake. And thanks to the wind keeping me awake most of the night, I had plenty of time to do some research into low fat chocolate cake. 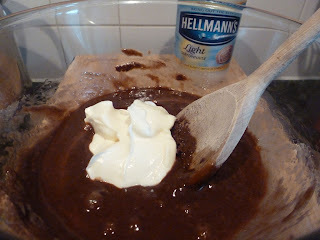 I remember reading somewhere about the idea of putting mayonnaise into brownies. Sounds disgusting. But a little Google revealed a recipe on the Good Food website that uses exactly this and it has a five star rating after 98 reviews. I had all the ingredients in my cupboard - it doesn't use butter which is good as butter is banned at the moment - so it seemed worth a shot for the purposes of this blog. And I have to say that as disgusting as they sound, the 98 people are right. The brownies are really quite light but still a bit fudgy. I do like my brownies dense and fudgy and brimming with chocolate chunks or nuts, but to have brownies on a diet that I can potentially eat on a day when I don't run without starving myself, these are really good. Of course, they'd be better with some additions or warmed with a scoop of ice cream on the side and some warm cherry compote on top, but you can't have everything if you are trying to shift some pounds. As it was the first time, I stuck to the recipe, save for two things. I only had a mix of half 50% plain chocolate and half milk. If I made it again, I'd probably go for a full 60% or 70% flavour, but it was still very chocolatey - just a little too sweet for my liking. The finished article. Not bad, if I do say so myself. I also had a panic about the lack of vanilla essence in my cupboard so ended up using a teaspoon of amaretto flavoured coffee syrup. This added 20 calories (shock horror!) to the entire recipe. I then realised I had a tub of vanilla bean paste in the fridge, but no matter. The amaretto flavour came through really well and if you're trying to keep calories down, it's worth experimenting with other syrups for flavouring. You could always drop a teaspoon of sugar to compensate. By using light mayonnaise and cutting the brownies into 16 pieces rather than 20 pieces, they came out at just 110 cals each. I personally think that the size was okay, but you could cut them bigger and it would still be a lower calorie treat than a regular brownie. But will someone please tell the Good Food team that you cannot cut 12 squares from a cake that is square in the first place. They will be rectangles. Or if not, my junior school teachers failed me somewhat. Heat oven to 180C/fan 160C/gas 4. Pour enough water into a small pan to one-third fill it. Bring to the boil, then remove the pan from the heat. Put the chopped chocolate into a large bowl that will fit snugly over the pan without touching the water. Sit the pan over the water (still off the heat) and leave the chocolate to melt slowly for a few mins, stirring occasionally until it has melted evenly. Remove the bowl from the pan, then let the chocolate cool slightly. Meanwhile, lightly oil and base-line a 19cm square cake tin that is 5cm deep. Combine the flour, cocoa and bicarbonate of soda. Using a wooden spoon, stir both the sugars into the cooled chocolate with the coffee, vanilla and buttermilk. Stir in 1 tbsp warm water. Break and beat in the egg, then stir in the mayonnaise just until smooth and glossy. 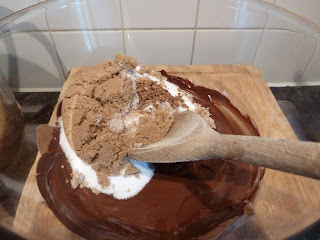 Sift over the flour and cocoa mix, then gently fold in with a spatula without overmixing. Pour the mixture into the tin, then gently and evenly spread it into the corners. Bake for 30 mins. When a skewer is inserted into the middle, it should come out with just a few moist crumbs sticking to it. If cooked too long, the mix will dry out; not long enough and it can sink. Leave in the tin until completely cold, then loosen the sides with a round-bladed knife. Turn out onto a board, peel off the lining paper and cut into 16 squares. While the chocolate mixture is cooling, chop the white chocolate into small pieces. Whisk the eggs and sugar with an electric mixer until thick and pale and fluffy. When the mixture is ready, the beaters should leave a trail on the top of the mix when you lift them up. This takes anywhere from 4-10 mins depending on your mixer. Using a rubber spatula, fold the cooled chocolate into the egg mixture using a gentle figure of eight motion. Try to combine well without over-mixing. Sift the flour and cocoa (again) into the chocolate and egg mixture, and mix using a figure of eight motion. Pour into the pan and bake for 25 mins. Bake for 25 mins then pull the shelf out a bit and gently shake the tin. If the brownie wobbles in the middle, it's not quite done, so slide it back in and bake for another 5-10 minutes until the top has a shiny, papery crust. (I also double check the middle with a cocktail stick) Take out of the oven. Cool in the tin until completely cold, then cut into sixteen squares and demolish!! What a good idea! Love the idea of using coffee syrups I have loads here to try out in brownies! They look really good in the photo, and very few calories. I might just give them a go!